With its Downhill pedigree, the Minion DHF 29" 3C/EXO/TR MTB Tire will give traction in almost any environment. 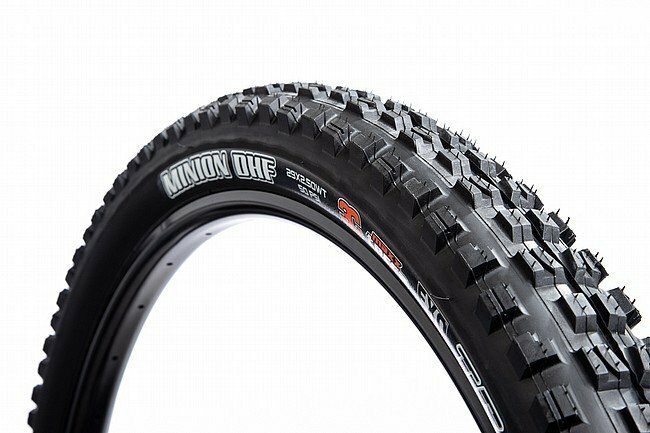 Originally designed for DH, the Minion DHF's tread pattern has been around for years because it works. Now available in this 29 x 2.3" version, those using the middle of the road tire size can benefit from the incredible grip offered by the DHF. Whether cornering or ripping down a straight, and regardless if you're rolling through mud, loose conditions, or hard pack, these tires will keep the bike under you. The Minion DHF 29" 3C/EXO/TR MTB Tire measures 29 x 2.3 inches (58 622 ISO). Also available in a 27.5" version. Black. 60 TPI. 925 grams. This is my first Maxxis tire, very satisfied. Sealed tubeless as quickly and easily a any tire I've used. Great corning traction even in wet. Used on the front I haven't noticed poor rolling resistance. The only downside, is its on the heavy side, however, not heavy in my opinion compared to tires with comparable grip and side wall durability. This Tire has been great throughout the fall and winter it has great bite for to shred those berms.